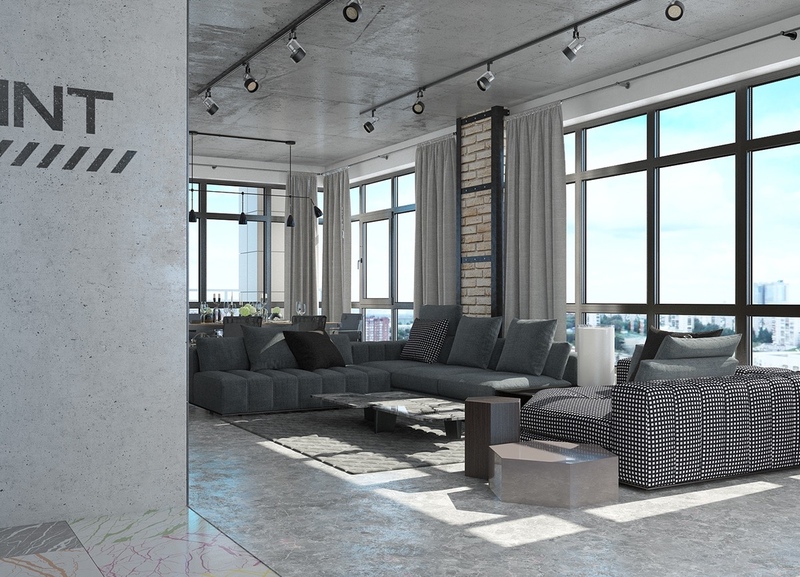 Lofts are known for their tall ceilings, wide open spaces, and industrial details. 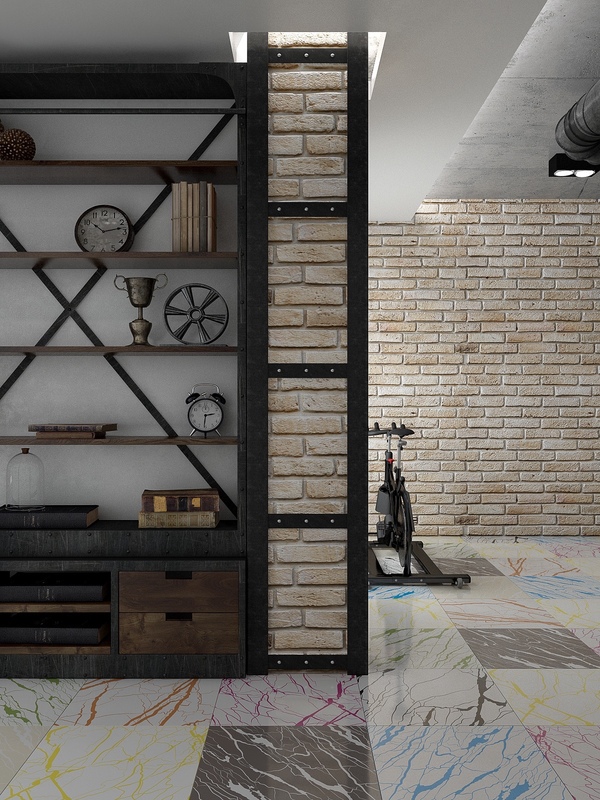 But loft designs vary from the ultra modern to the eclectic, and the people who live in them transform these similar architectural spaces into designs that reflect their lives. 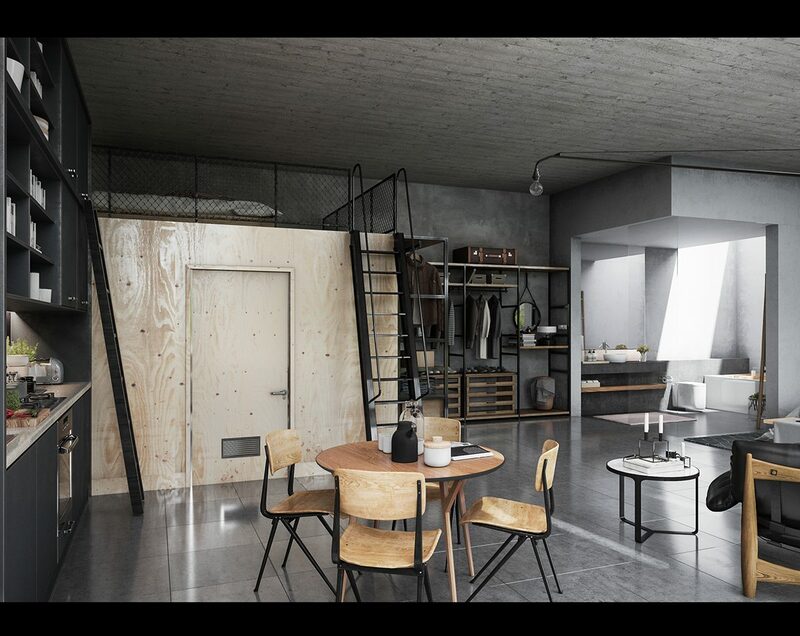 So take a tour through these 4 lofts and get a peek inside the chic and sophisticated loft-lives of everyone from world travelers to ballerinas. It'll inspire you and leave you dreaming. 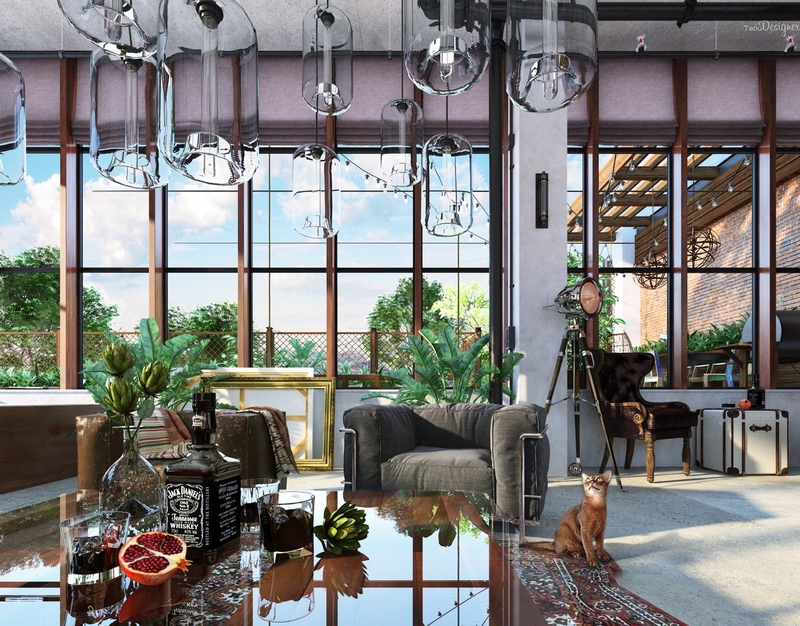 This eclectic loft was designed for a man who appreciates art, loves to travel, and adores his cat. There’s plenty of plush oversized seating for his feline friend which fits perfectly into this giant space. We love how everything here is oversized. From the couches to the art, the windows, and the lamps. 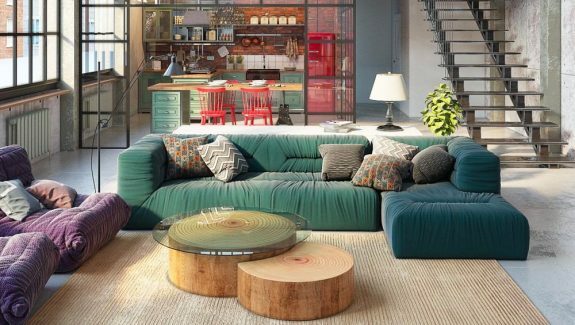 These massive pieces bring this lofty space back down to a cozier level. This loft sits right up near the treetops, and we love how they’ve brought the outdoors in with these leafy plants by the windows. The greenery is also a great contrast to this beautiful Persian rug, and all the warm colors and woods scattered through the space. This fireplace is incredibly beautiful. We love the spherical shape, how it creates a wonderful reading corner surrounded by bottles of wine, and how the cool metal contrasts with the fire. 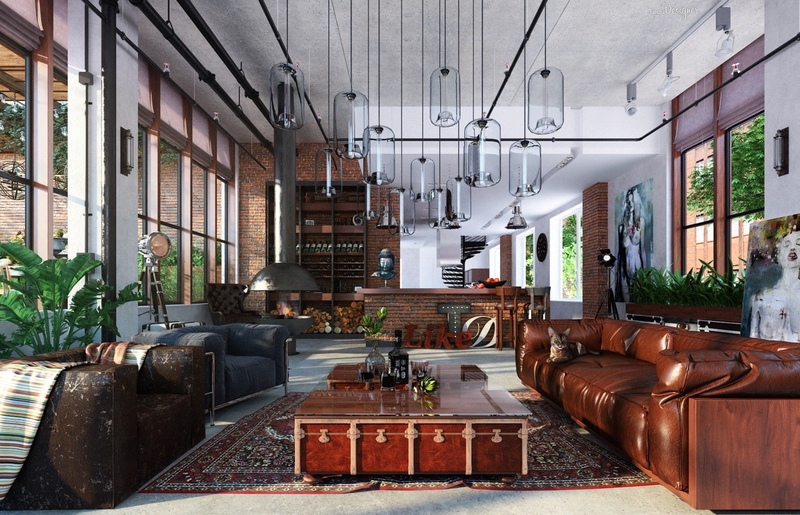 It’s a stunning piece of art that fits perfectly into this eclectic loft. 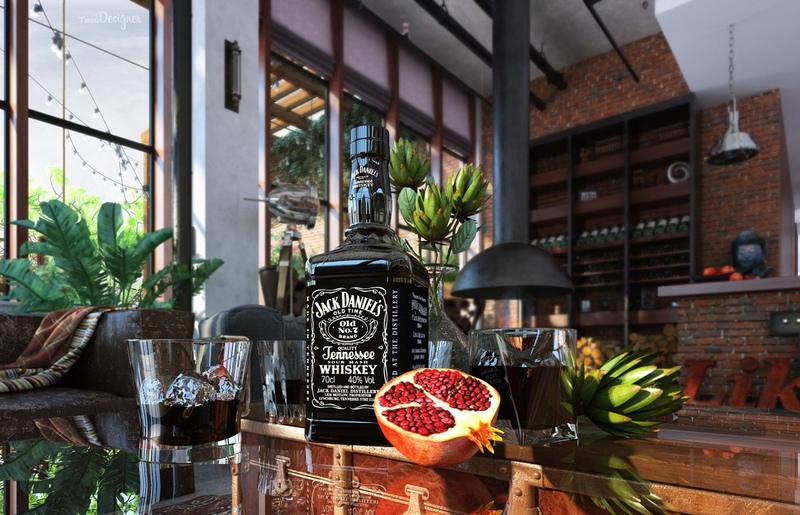 This loft is the perfect place to kick back with a strong drink, enjoy good company, and admire all that surrounds you. 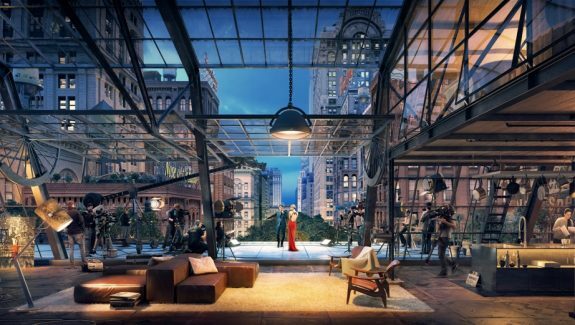 We bet there will be some pretty fun parties at this loft. And if the inside didn’t convince you of that, this deck sure should. The hanging lights play on the whimsy of this eclectic loft, and the stunning woods bring you off to a far away exotic land. We love the contrast of the stark white an the woods, and how they’ve created privacy with the greenery around the sides. 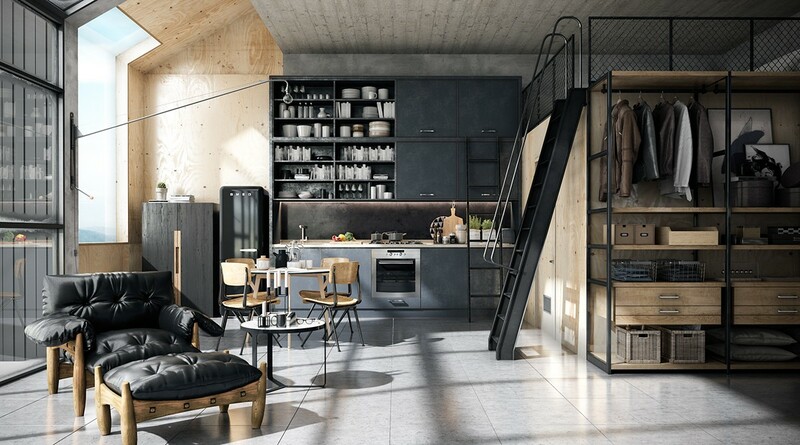 This loft was designed for a young creative family, and you can see that in all the creative design solutions and decisions. 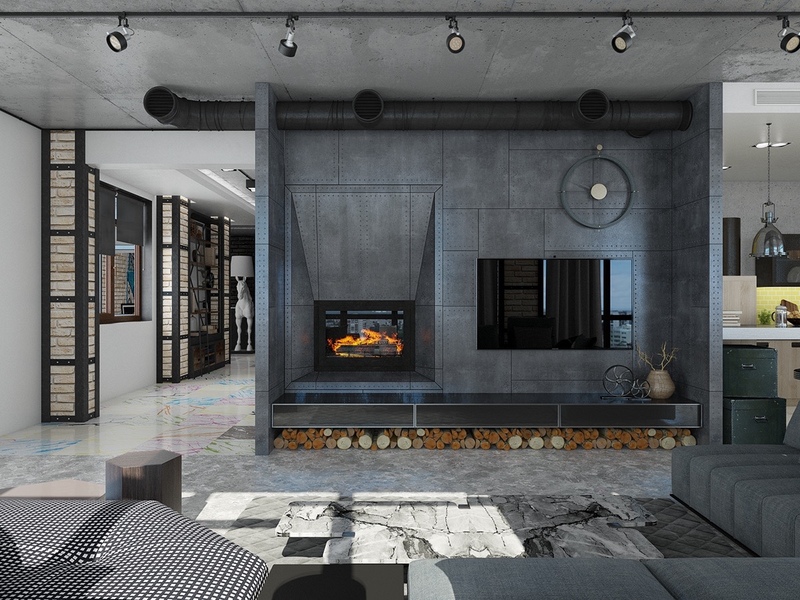 We love the metal fireplace and tv surround, and how they’ve mixed that with the warm handout wood storage underneath. 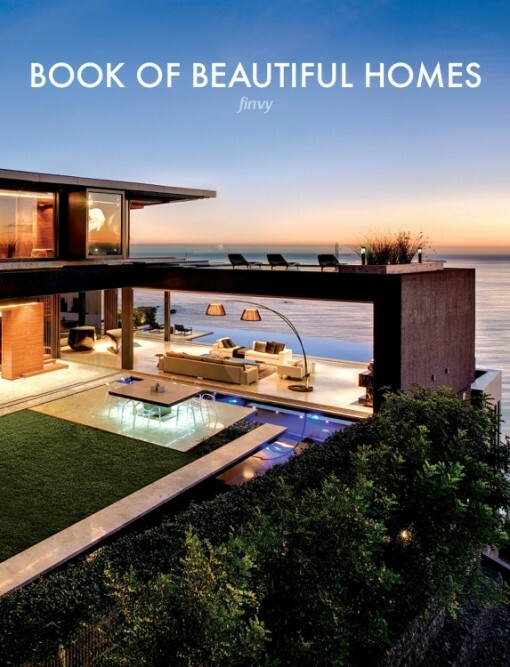 This place may look serious from the cold, gray, and modern design choices but it’s also whimsical in a modernist way. 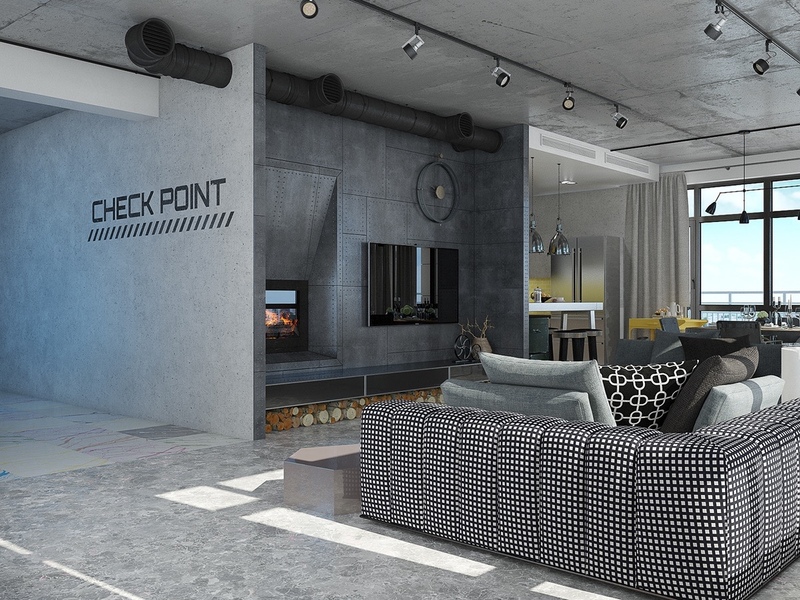 We love the mix of tweed, and patterns in the couch and how the entire loft looks futuristic. 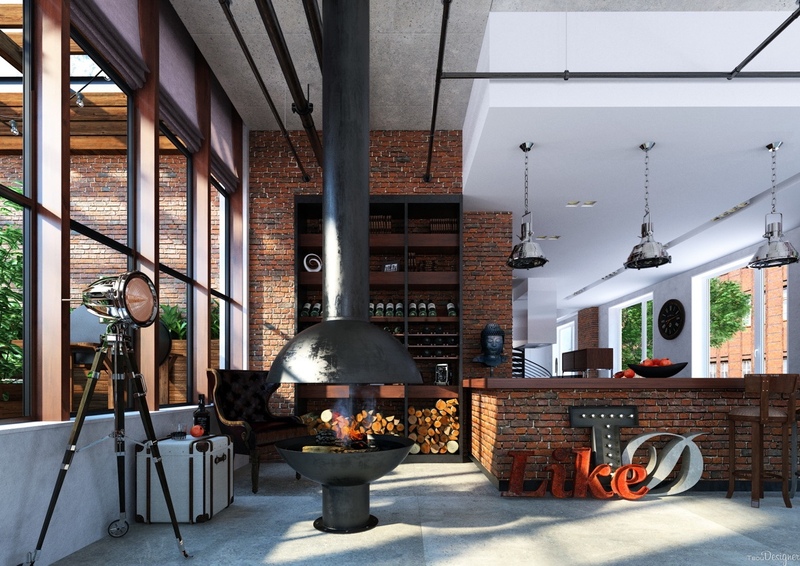 Here you can see more traditional elements of a loft: tall ceilings, giant windows, and exposed beams and pipes. 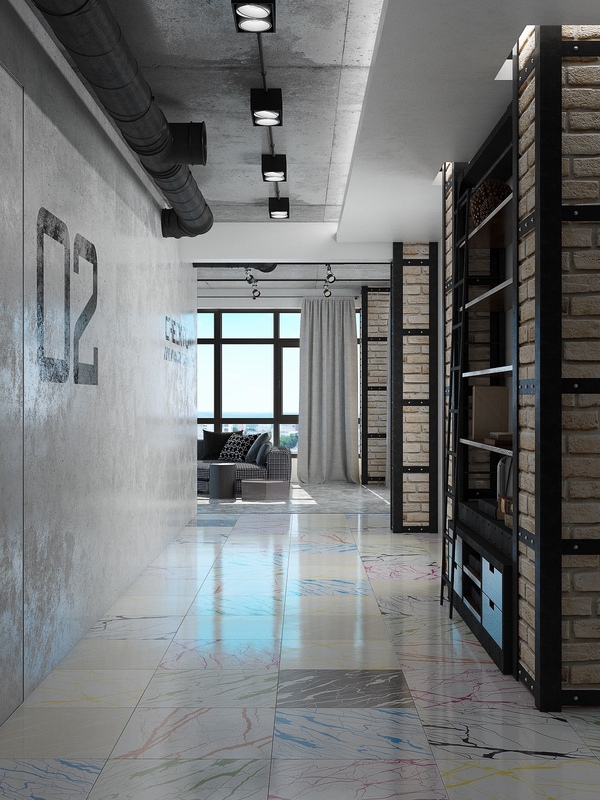 They’ve definitely played up these elements in this modern loft. 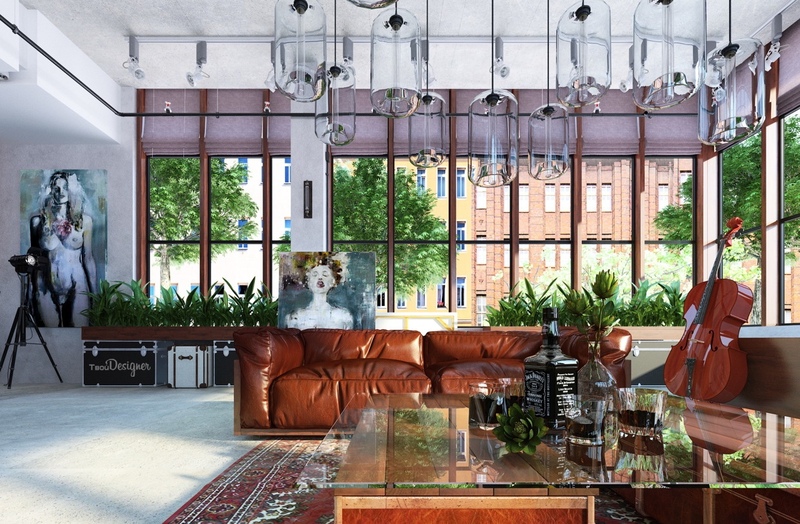 From here you can see those amazing windows, and the classic loft exposed brick. We love how they’ve played on this in their own way here, framing the brick in this dark metal that looks like supportive beaming. It ties into the rest of the space’s metal while mirroring the lines of the windows. Finally, a pop of color! 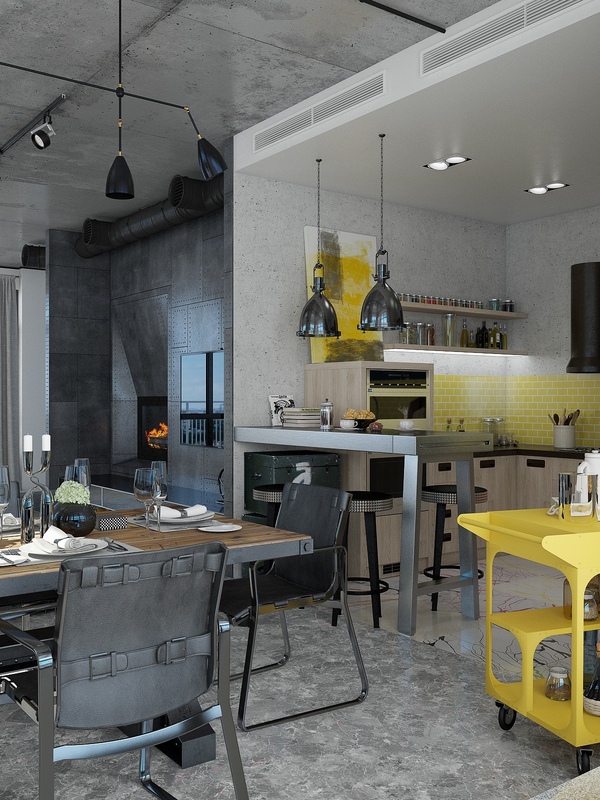 Yellow and gray is an incredible choice because they’re so opposite, and we love how the yellow they’ve chosen is inherently warm yet has a cool undertone that matches the gray perfectly. These chairs are incredible. They’re whimsical and modern like the rest of the space. We love the curved edges, these vintage looking straps, and how the metal looks brushed and aged. 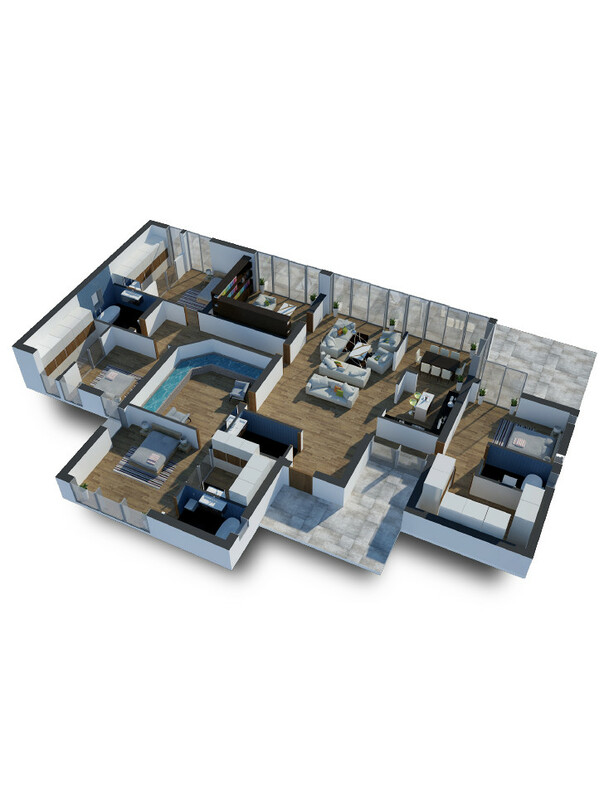 Two main spaces of the home are separated with different flooring. 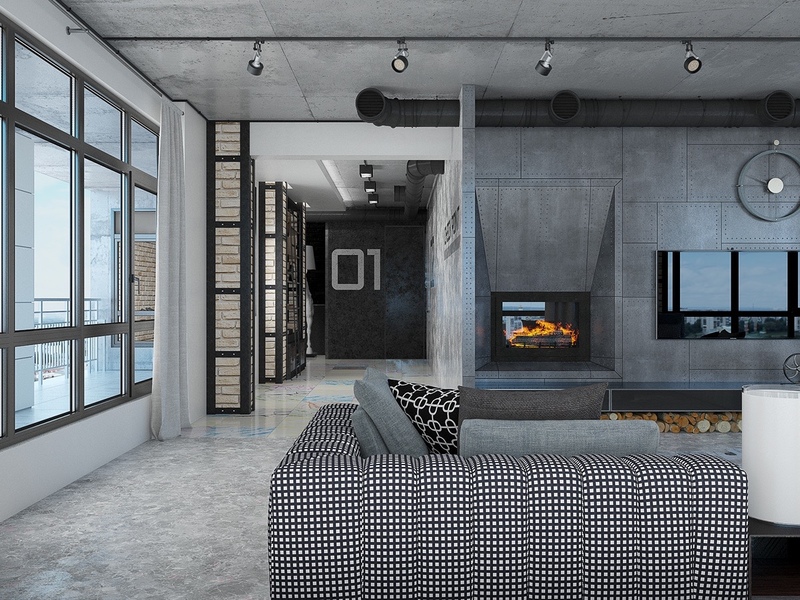 The gray, stamped and distressed concrete floor of the living room mirrors the industrial feel. But this colored, almost marble looking tile is a fun modern twist on something normally organic. We love how the tiles are different colors. 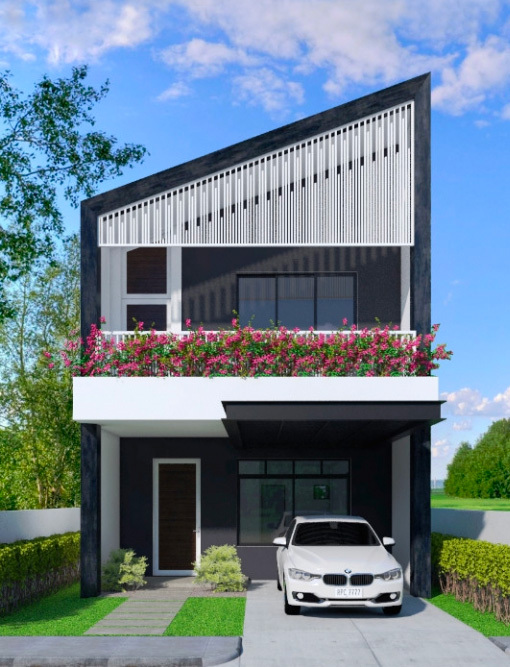 One color would have been enough of a surprise, but this myriad of colors is just the kind of ‘pop’ this home needs for a young creative family. The bold colors against this very rusty and metal built in is quite the contrast — but opposites do attract. 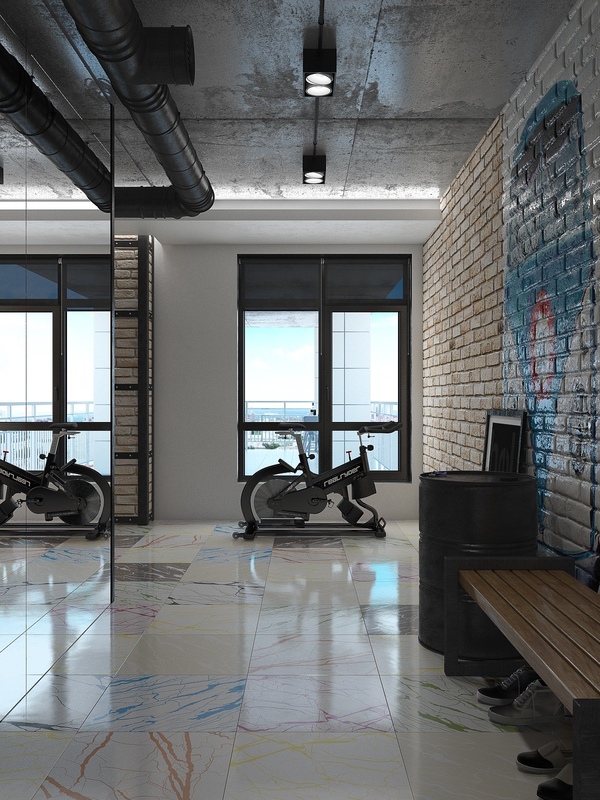 These tiles make the room feel massive with their mostly white surface reflecting tons of natural light. 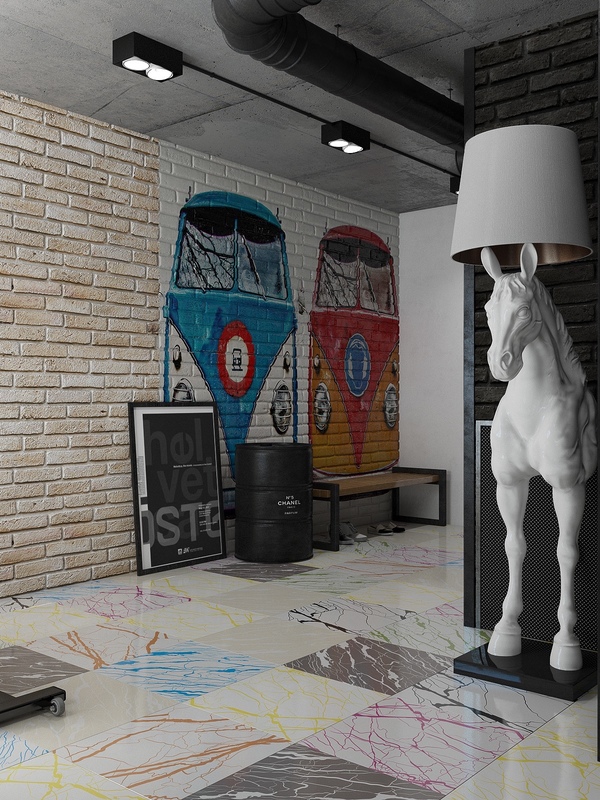 This is fun — from the colorful tiles, to the wall mural, to this statement piece of a lamp. This space is super modern, chic, and best of all fun. We love the white-washed brick in this space. It carries the brick from the living room but at the same time gives it it’s own character. No detail went unattended in this space. From the chairs we mentioned before, to those stools with the studs around the sides, and the kitchen cart that’s bright and yellow like the backsplash. 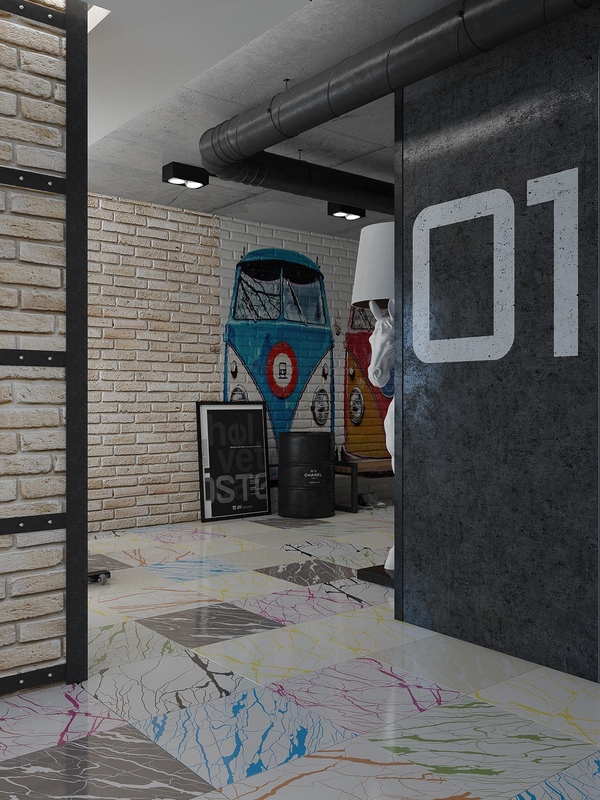 This space is edgy, funky, and artsy from both afar and up close. 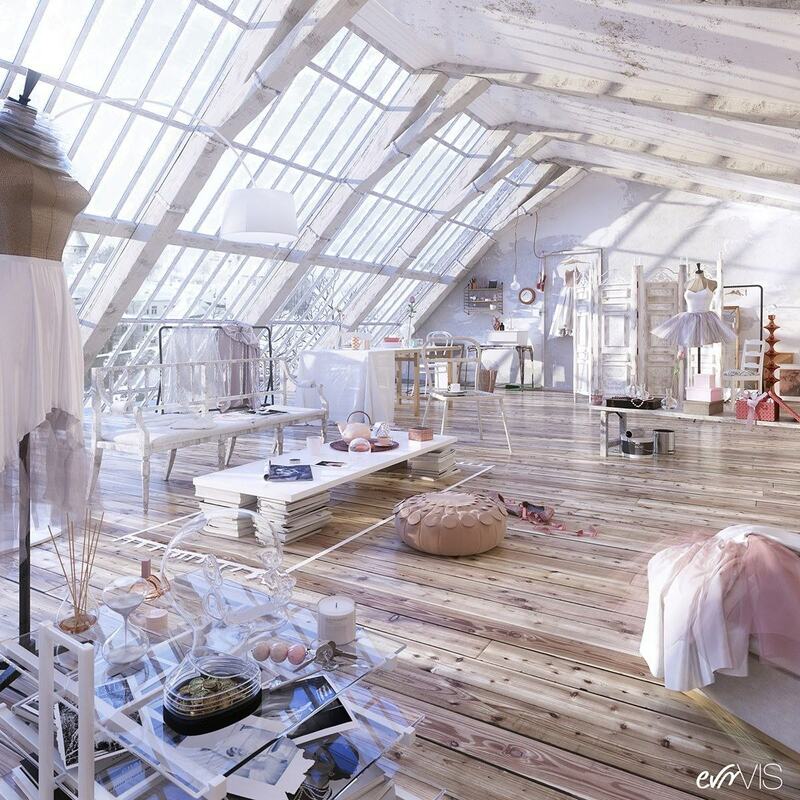 This giant loft was designed for a ballerina, and the space is the epitome of girly, shabby-chic. 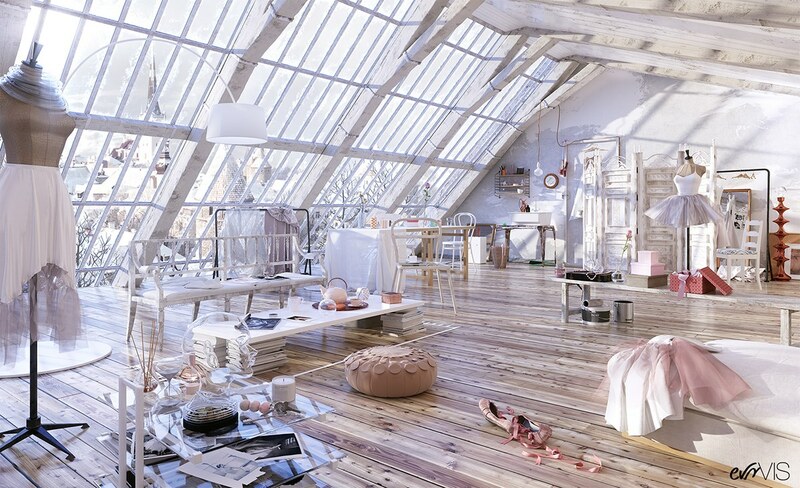 From the white on pink combination, to the antique details against the lofty and industrial structure, this space perfectly contrasts and compliments. First off, the knotty wood with pink undertones is fabulous, and we love how this blush color is reflected in the rest of the space. This space is big and airy but has lots of layers, whether it’s the way the tables are staged or the dispersed antiques. 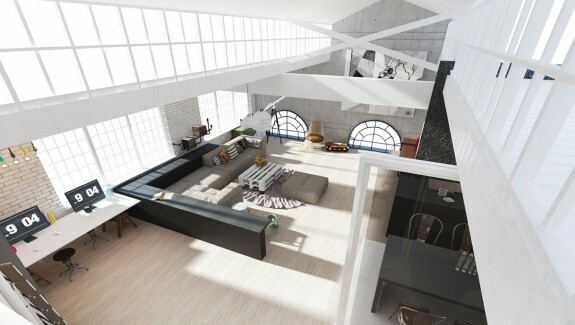 These incredible windows define this loft space. They’re not only massive, but they’e got tons of character. 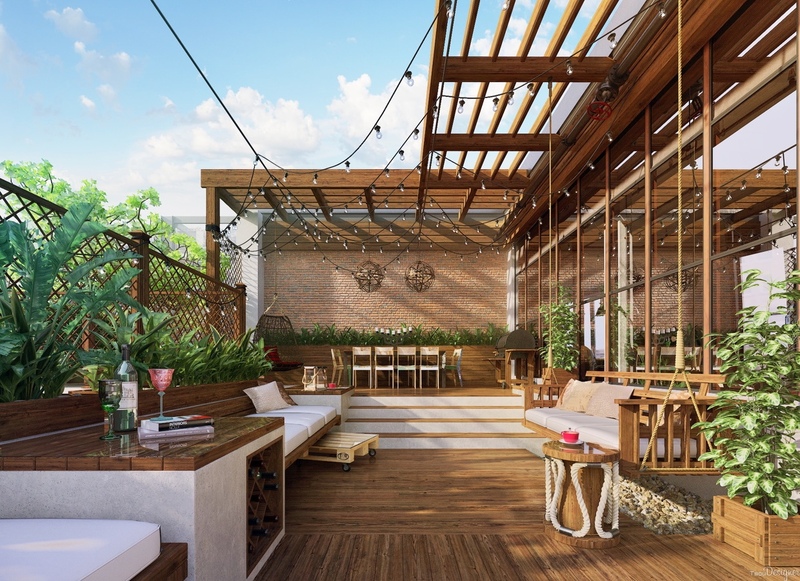 They’re wooden, white washed, and yet industrial despite their country-like makeover. They look old yet new, just like the rest of the space. 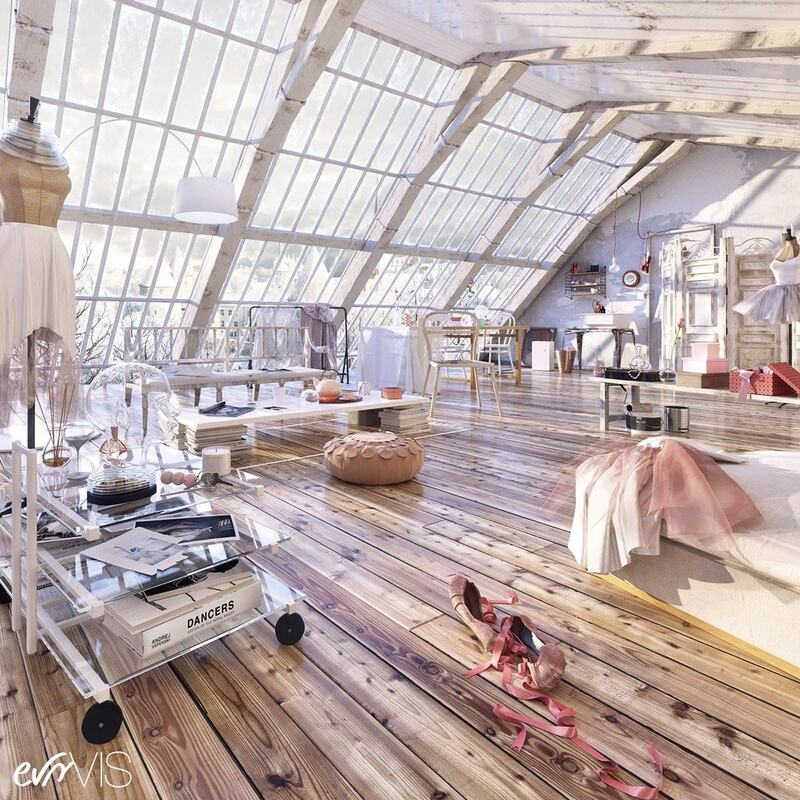 This loft is big enough for a dancer to push all that beautiful furniture to the side and dance the night away. 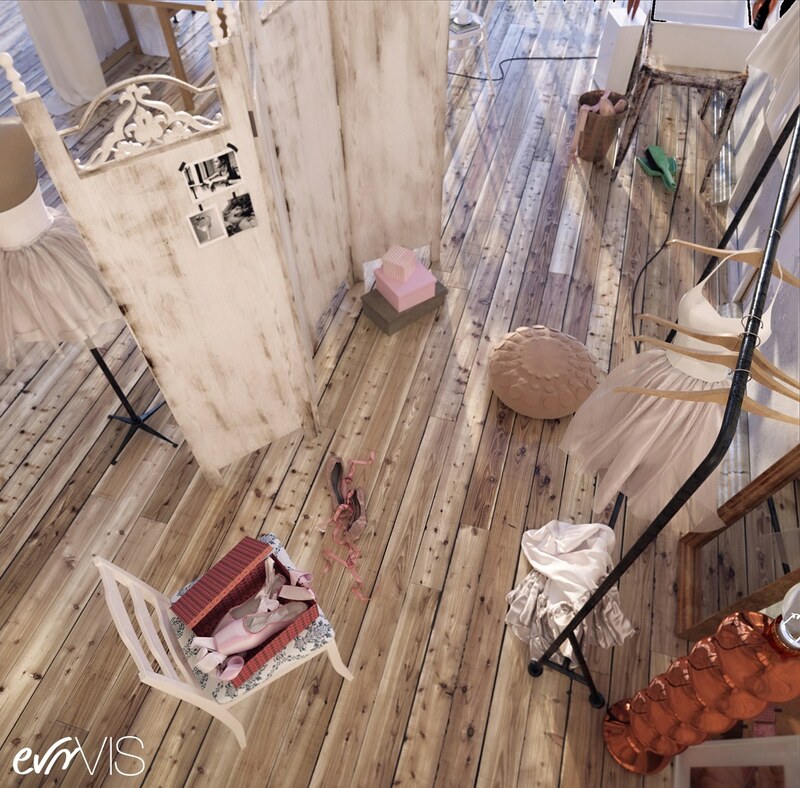 We love how the space, while scattered in treasures, feels open and filled with possibilities. Everything to the smallest detail was thought of here. Like this wonderful sculpture which once again plays on the airy feel of the room, to the blush tinted accents. 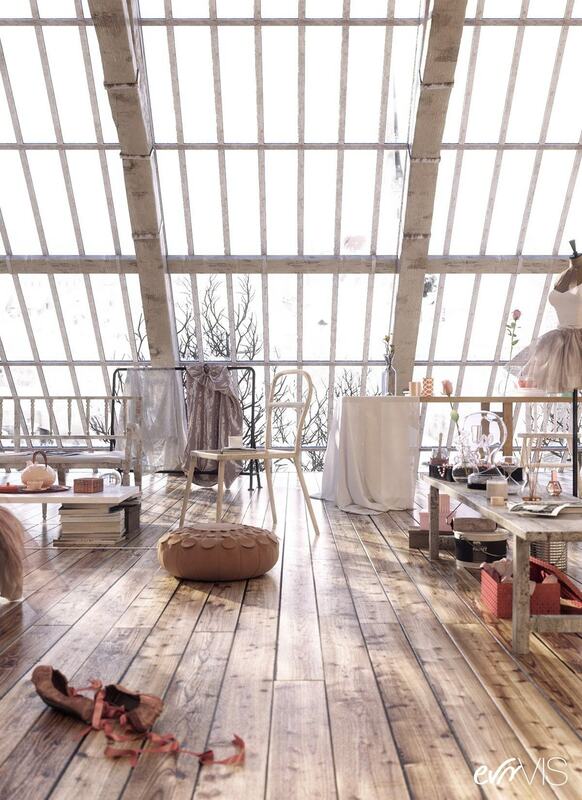 Up close you can see the grainy, knotty, pink wood that defines this loft. 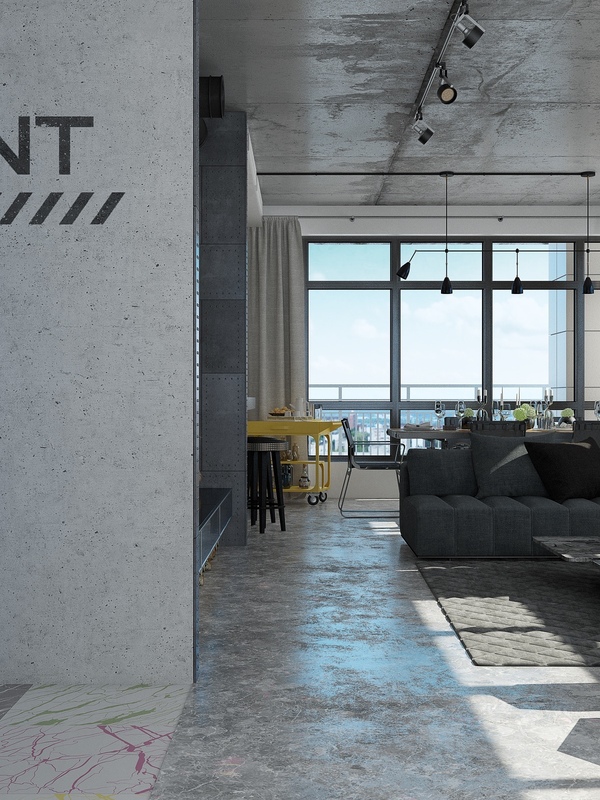 With big open lofts you often have to define and create the spaces you need. This dressing area is a great example of doing just that, and you could do this yourself with a separator to create a reading nook or even a little home office. 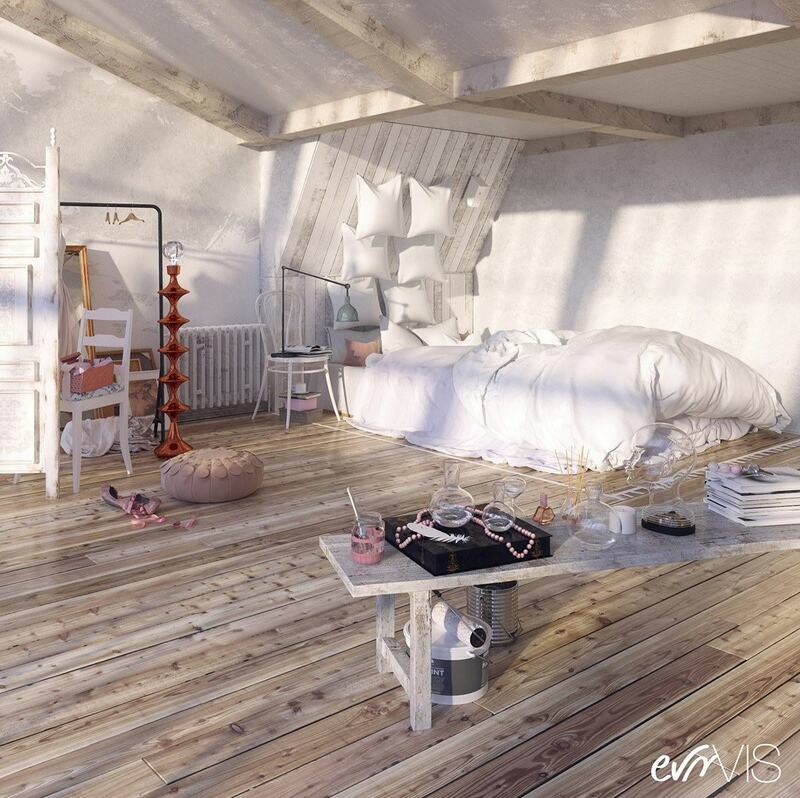 The bedroom part of the loft is just as dreamy as the rest. 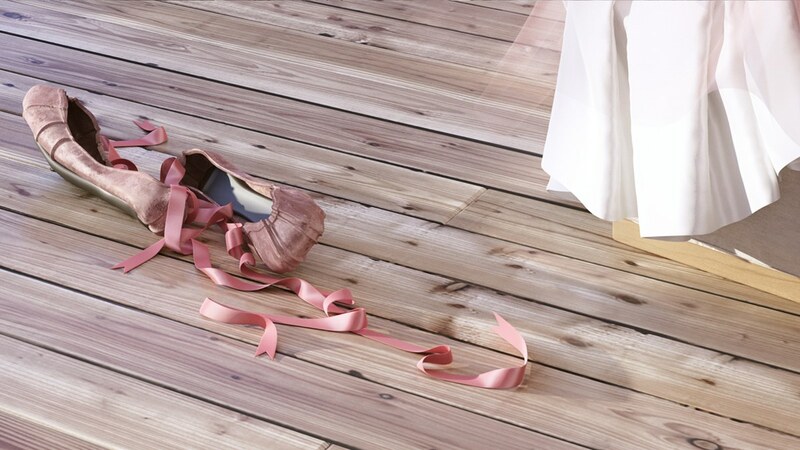 That bed looks like the perfect place for a ballerina to kick back and relax after a day on her feet. We also love how the ceiling comes down here, creating a cozy nook in an otherwise lofty and large space. This space looks like it was designed for a man who appreciates the finer things in life while still wanting to remain comfortable. That’s reflected in his wardrobe of leather jackets, and pieces like that big armchair covered in leather, and bolstered up by weathered wood. It looks old yet modern and regal. 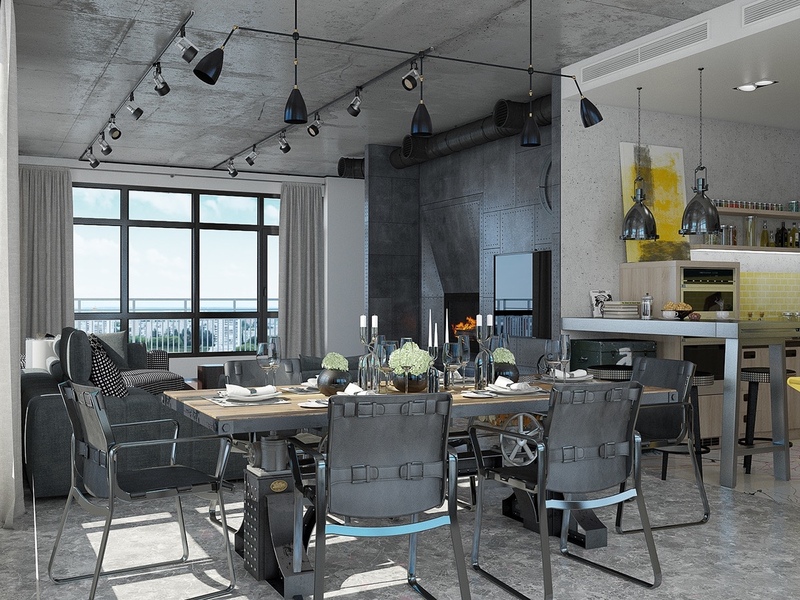 Black, gray, wood, and pops of white are the theme of this space. 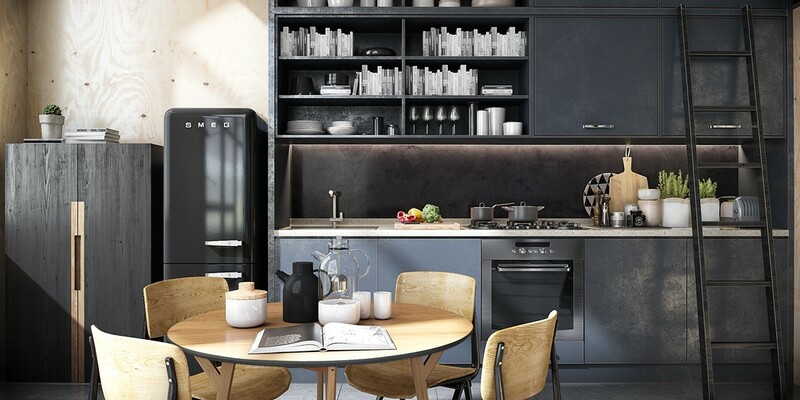 We love the dark gray cabinets against the exposed plywood walls, and how they’ve backlit the dark backsplash. The use of mirrors in a space are great to reflect light, or bring the outside in — just like they’ve done here. The mirrors add greenery from the garden to this very metallic and otherwise dark space. 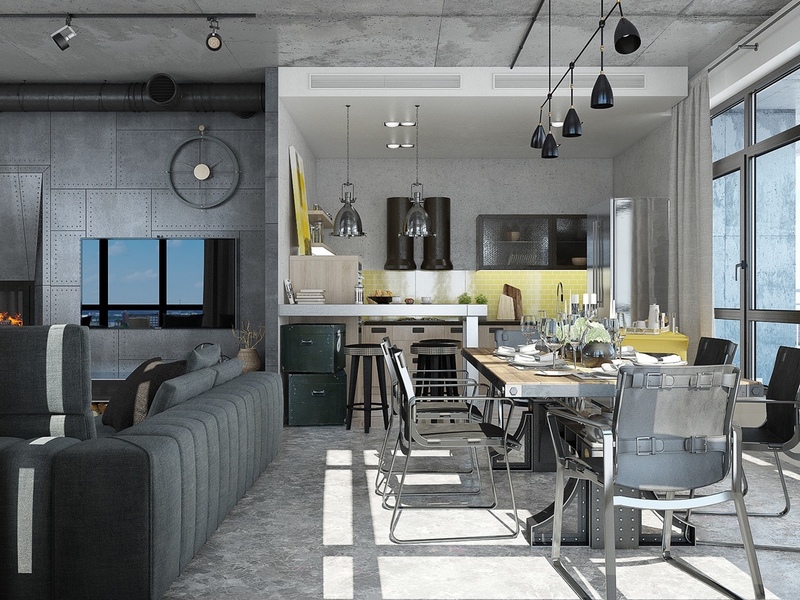 The contrast of the stunning green and these cool grays is fabulous, and we love how the floor to ceiling windows bring that right inside from this angle. The skylight in the bathroom is also a clever solution to a room that’s otherwise cut off from the light in the rest of the loft. Exposed plywood doesn’t have to look messy, intact it looks quite chic here despite it’s low budget. 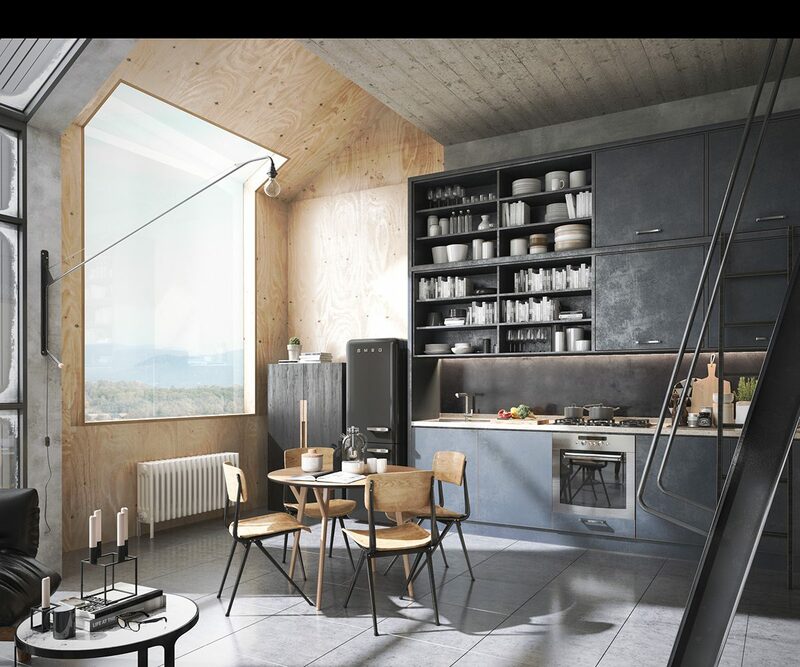 And the exposed plywood was also used for the loft to tie the spaces together, and add a bit of organicness and color to the dark corner.